This book, a classic that contributed to the concept of permaculture as we know it today, reflects a lifetime of research around the world and personal trials on the author’s farm in Virginia on the uses of perennial tree crops for animal and human food. Now available for free in an improved digital version, courtesy of Walden Labs. Note: Once you register, you’ll have continuous access to the Self-Reliance Catalog via the username (email address) you enter. An account password will be sent to your inbox. We’ll also send you brief announcements when new content is posted. As always, we respect your privacy, and you can unsubscribe at any time. 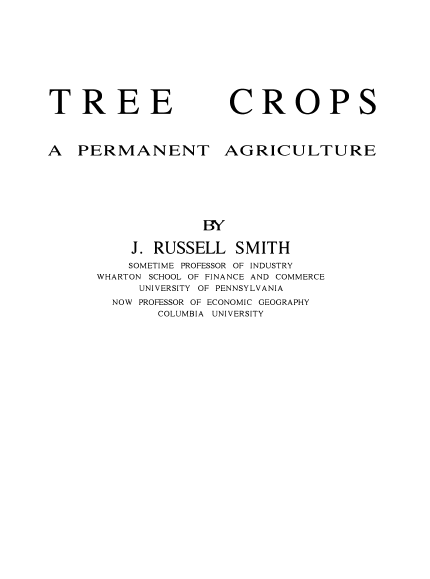 This digital document, a scan of the 1929 edition of Tree Crops, was scanned and prepared by the Soil and Healthy Library in 2009 and then released into the public domain. In 2016 this document was reworked and improved for digital viewing by Walden Labs. The 2-page spread was split into single pages, the text was realigned, and every pale photo in the book was digitally touched up to look its best. Finally the pages were turned into beautiful black and white text. Stock-food trees, the producers of bran substitutes, is food for animal and human alike. It’s been used as food in the Mediterranean region for several thousands of years. Learn about the Carob and the Keawe, or Hawaiian Algaroba. The Summer Pasture Trees and "Corn Trees"
Learn about the mulberry, a summer pasture tree for swine and poultry. And the persimmon, “a pasture tree for the beasts and a kingly fruit for man.” Also learn about the two trees that could replace corn: the chestnut and the oak. Can tree crops replace the nutrition we get from meat and butter? Sure they can. Learn about the acorns and nuts as human food. You’ll find information on the Persian walnut (Juglans Regia), the eastern black walnut (Juglans Nigra) as well as other walnuts and hickories such as the pecan. This was one of the classic texts on conservation agriculture that was a big influence on permaculture. Some people actually say that Permaculture One was really primarily a restatement of this classic. [...] What he does in this book is go around the world looking at different tree crop agricultures based on perennial plants, based on trees, in great detail and then talks about the opportunities to develop that further. [...] I still think this book has got an enormous amount of information and it is perhaps a sad inditement that his analysis and laying down the research agenda on selection of oaks and acorns suitable for human food is still an open field where there are lots of people who are aware of the issue and who have planted oaks inspired by permaculture and similar ideas in more recent decades but we're still waiting for that very substantial work to be done to actually bring the full potential of a lot of these tree crops to the fore. Between these two books [Farmers of Forty Centuries and Tree Crops], you’ve got solutions to most of what faces humanity, food-wise. Read them. Be inspired. Ben Falk Whole Systems Design, LLC. Want More Free Books on Permaculture & Self-Reliance Like This One?